Why us, why here, why now? We know we are men here in the UK, black, and queer. And we know that we need to talk; to each other and to the communities we are part of. So we created this space for us to think, shout, show off, curse, celebrate, laugh, reflect and share. Our own space to hear and be heard. Why now? Why has it taken so long? BlackOut UK is a not-for-profit social enterprise run and owned by a volunteer collective of black gay men. We recognize and celebrate the diversity of experience and views among black queer men in the UK (extending even to what we call ourselves) and are seeking to create spaces to explore and reflect on our commonalities and differences. While the editorial team maintains control over the quality of content, we are keen to reflect the diversity of our community and not to impose an orthodoxy of view or opinion. We believe that the whole can be greater than the sum of parts and are working to build a sense of community between black queer men in the UK. 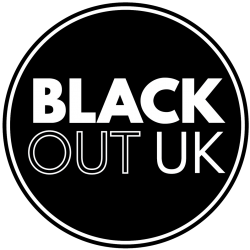 BlackOut UK will encourage and stimulate debate and discussion online and face-to-face through this website, writer workshops, networking events, and supporting interventions to meet the needs of black queer men.